Even that list of tracks is generous. "Peace" doesn't immediately strike me as a great Depeche Mode song, but when I picture the big crowd at Lollapalooza this year singing along, it actually makes sense. It's one of those singalong anthem kind of tracks. Furthermore, any weaknesses of the song are more than made up for by the insane high note Dave Gahan hits at the tail end of the "I'm going to light up the world" lyric...twice. Plus, I love the lyric "There is a radar in my heart I should have trusted from the start." Despite whatever song from the aforementioned list you or I might think is the best on the album, there is no doubt that any of them would have made a better first single than 'Wrong'. In fact, the title of that song is pretty descriptive of that choice. "Come Back" had such a familiar feel to it that I could have sworn it was a cover, but it turns out it's an original. Either that or "In Chains" would have been my choice for the first single. In the end, it's clear that Sounds of the Universe is a better album than Exciter could have ever dreamed of being. 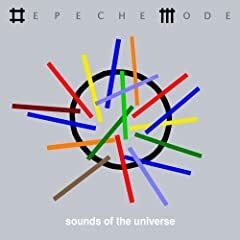 It doesn't have an obvious hit like Playing the Angel's "Precious," and doesn't hold a candle to Ultra, but it's got a decent selection of solid Depeche Mode songs that make the album worth buying despite its weaknesses.